digital-media-lab - research: Are You at Risk of Employee Fraud? blindsided by fraud: Know when employees are likeliest to steal. 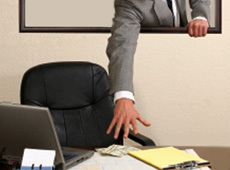 Do you wonder whether you could ever be the victim of employee fraud? Stop wondering--you could. "Something like three out of every 10 businesses will have employees who steal," reports Janine Driver, author of You Can't Lie to Me, who spent years training FBI, CIA, and ATF agents in how to spot dishonesty. No matter what business you're in it can happen, she says. "One dentist worked with the same assistant for 30 years," she says. "Then her house was being foreclosed, so she forged his signature cosigning a loan." The woman paid her loan and the fraud would have gone undetected--except that the bank sent the dentist a congratulatory note when it was paid off. "It's not the homeless person out on the street stealing from us, but the person we trust," Driver says. In spite of her expertise, it's even happened to her. With a busy speaking schedule, Driver had a management company handle her bookings, as well as invoicing and processing payments. One day, out of curiosity, she followed up a text from her bank acknowledging a deposit--and discovered that the payment had come from a booking several months earlier. Come to find out, the company had been withholding money, often depositing it long after the payment was received. "At the time, they owed me about $8,000, but they'd been borrowing and paying back for years," she says. When she consulted an attorney about it, he told her she was the sixth fraud victim to contact him that month. The employee can somehow justify his or her actions, perhaps feeling that he or she deserves higher pay or should be compensated for extra time on the job. If all three elements are present, Driver says, the likelihood of an employee committing fraud are very high. Protect yourself by making sure you're aware if any employees are facing financial difficulties. You want to know so you can be understanding and helpful, but you should also keep in mind that an employee in this situation is likelier to turn to crime. Obviously, you need to be especially vigilant of anyone who has access to your company's bank accounts. How much of this résumé is true? Though you can never completely screen for fraud, Driver says careful hiring can help reduce the risk. For one thing, she recommends getting a credit report before signing someone on, a step that more and more employers, including the federal government, are taking. If someone's facing the sort of financial trouble that might lead him or her to steal, chances are it'll turn up. She also recommends asking job-seekers to certify that all their answers will be true at the top of an application--before they fill out the rest--rather than at the bottom where it's traditionally found. "If people have already lied, they'll mentally justify it and sign," she says. You can take that method a step further by having a two-part interview process, she adds. Begin by having a preliminary interview with an associate. At the end of the interview, the associate tells the applicant that while he or she seems like a good candidate for the job, you're meticulous and will check every single item--so any inaccuracies should be corrected before the person's résumé gets passed along to you. And then the associate should ask: "On a scale of 1 to 100, how accurate is it?" The answer will be illuminating, Driver promises. "Almost no one will say 100%. They'll say 90%, so you ask about the other 10%." The answer might be that the applicant can't remember whether a job started in May or June. Or it could be that he or she was fired from a previous position. This tactic can be surprisingly effective. "We see it in law enforcement," Driver says. In one interview, an agent asked a suspect how much of his statement had been true. "99%" came the answer. So the agent asked which 1% was inaccurate. Answer: "My involvement in the crime."